The holidays are back, and that means tables filled with a scrumptious feast of seasonal foods. 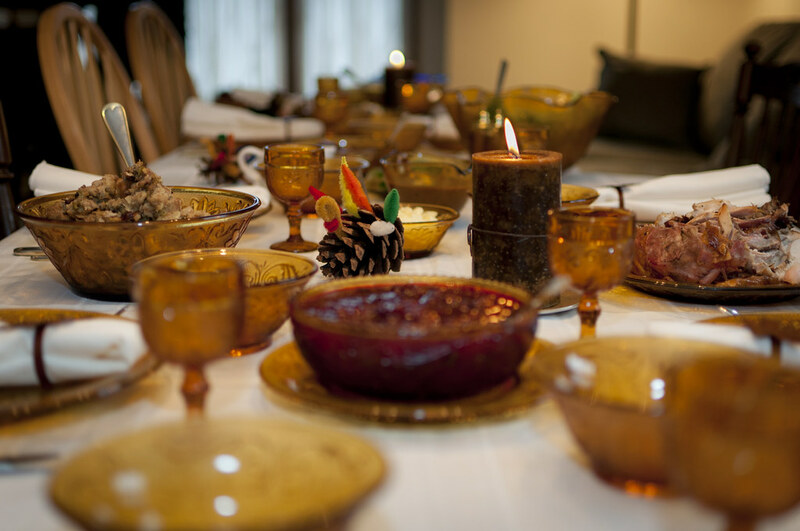 When you have an alternate diet, whether through allergy, sensitivity, or choice, the bigger the bounty, the greater the torture as you are forced to watch others eat the holiday favorites you can’t have.This deprivation can turn what should be a joyful time together with friends and family into a tortuous event. However, with the right allergen-free, vegan, or gluten free thanksgiving recipes, you can enjoy traditional favorites without the traditional irritants. Even for those without dietary sensitivities, Thanksgiving is rife with pitfalls. Foods tend to be high in calories, leading to weight gain and bloating. Many have a high glycemic index which, aside from weight gain, can lead to acne outbreaks and dull skin. The near constant dairy intake can easily lead to inflammation and puffiness, especially around the eyes. All in all, it can be a trying time for anyone’s healthy-eating goals. For those without dietary restrictions, it can be almost impossible to navigate while staying completely true to a healthy meal plan. Many of our traditional foods are made to “taste better” by adding large amounts of butter, sugar, cheese, and gluten, contaminating them with items that aren’t the best for your gut or your skin. Whether you need dairy free Thanksgiving recipes for yourself or gluten free Thanksgiving recipes for a loved one, there is a better-for-you holiday treat waiting to be made! Saute onions, celery, parsley, and mushrooms for 3 minutes, stirring constantly. In a bowl, mix sauted vegetables, bread cubes, and seasonings, tossing well. Slowly add in broth a half cup at a time until contents are thoroughly moist, but not soggy. Stir the beaten eggs in with a large spatula, mixing thoroughly. Pour stuffing into a 6-quart slow cooker and cook covered on low for 6 hours. Check the stuffing periodically for dryness. If needed, a drizzle of broth or water can be added to keep it moist. Replace the butter with your preferred butter substitute for a dairy free thanksgiving recipe. Replace the butter with your preferred non-animal substitute and the egg with an egg substitute. Two tablespoons of unsweetened applesauce is a good choice for a crisp fall flavor. Rather than poultry broth, your favorite vegetable broth will work wonderfully for a delicious vegan and gluten free Thanksgiving recipe. This is one of those dairy free Thanksgiving recipes that will work well on your dinner table year round. It’s tasty, savory, and makes an excellent complement to many meals. 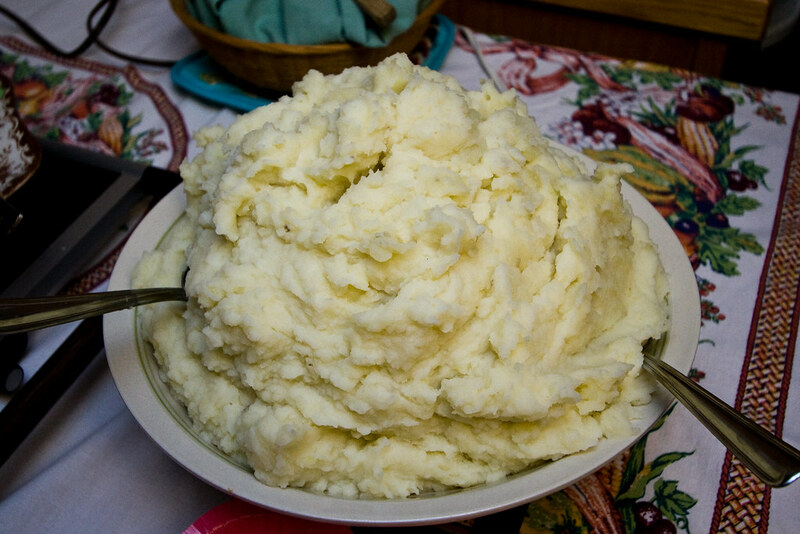 Drain potatoes into a colander, then return them to the pot and mash vigorously. If you don’t use nondairy milk, you can substitute poultry broth for a similar moist and creamy texture. Sweet potatoes can also be used instead of Russet potatoes for a higher vitamin content and more fiber. Always check your ingredient labels, but this is generally already a gluten free Thanksgiving recipe. Be conscientious about labels, but many dairy free milks and butters are free of other animal products as well. There’s always time for pie. This holiday staple goes great at any get-together and can easily be altered into one of your staple gluten free Thanksgiving recipes for family and friends. In a bowl, combine flour, salt, and sugar, whisking until evenly mixed. Cut in cubes of vegetable shortening. You want a crumbly texture, but there are variations among shortenings. If needed, add additional shortening a tablespoon at a time until the desired texture is reached. Drizzle the water into the mix, mixing until the dough begins to stick together. Once it’s holds together without being too sticky, you’re done! Wrap your dough and place it in the fridge for at least an hour. Lightly sprinkle flour on a flat surface and place the dough ball in the center and roll it out until it is a few inches bigger than your pie tin. Flip the crust into your tin. Pinch the excess edges into a knurled edge and cut off remaining excess. For a gluten free Thanksgiving crust recipe, you can use your favorite all-purpose gluten free flour, pecan flour, almond flour, cassava or rice flour. Combine all ingredients in a bowl or mixer. Mix thoroughly. Bake for 1 hour, then let cool before chilling for 4 hours (or overnight). When you remove it from the oven, the center may still appear wobbly. It will set fully while chilling. Substitute boiled sweet potatoes for the pumpkin for a baked sweet potato pie that is high in fiber, vitamin A, and vitamin C.
Candied yams are a super-sweet holiday tradition. They’re like desert in the middle of dinner! This recipe is simple, quick, and will get those yams back on your plate. It’s also a naturally gluten free Thanksgiving recipe. Rinse and peel your sweet potatoes. Slice them into ½-inch slices and lay them evenly in a baking dish. Combine warm water, cinnamon, maple syrup, and vanilla extract, whisking vigorously until well mixed. Now, stir in the orange juice. Pour candying mix over yams, cover tightly with foil, and bake for 45 minutes or until yams are fork tender. Once yams are tender, remove foil and bake uncovered at 425℉ for 30-45 minutes until yams are completely candied. Instead of the traditional heavy, creamy vegetable side dishes, consider doing some simple oven roasted vegetables of your choice. Our favorites include brussel sprouts, carrots, parsnips, cauliflower, and turnips. Simply lightly toss the vegetables of your choice in a light drizzle of olive oil, a sprinkle of salt and pepper. Roast in the oven on 400℉ for 30-45 minutes or until golden brown. Stir halfway through cooking to ensure even crispness. Also - never underestimate the power of a delicious fall salad. We love tossing in dried cranberries, chopped apples, pears, and pecans in with leafy greens for a satisfying and sweet crunch! In your own vegan, dairy free, and gluten free Thanksgiving recipes, you can scrupulously check labels. When attending events with friends, however, it can be a bit trickier. As long as you bring a dish that fits your dietary requirements, you know you’ll have at least one safe thing to eat, but the better choice with any food sensitivity is to reach out to your host. While it’s not realistic for the whole event to revolve around your needs, it’s perfectly acceptable to ask for a head’s up if something has an ingredient you are sensitive or allergic to. The holidays should be a time of fun and togetherness with family and friends, and part of that togetherness often comes around a table full of food. With the right vegan, sugar free, dairy free and gluten free Thanksgiving recipes, you can make sure everyone around the table gets plenty to eat. Make sure your skin doesn’t suffer from the consequences of unhealthy eating by maintaining a regular skincare routine and using Ayr Skin Care products to keep you looking and feeling radiant.